A bunch of goons close in on a government official for doing his duty rightly in the middle of the small town the film is set in. The government official (Vidharth) has already been beaten black and blue at the goons’ den once. To top it all off, his hands are tied at the back – this, obviously, restricts his movements. The goons, then, throw warnings and flash machetes to show their power. They are almost certain that they can’t be touched in their town. At this point, we already know that the hero of Kodiveeran, Sasikumar, is going to make an entry to save Vidharth and put a dent in the goons’ plans. But how’s he going to do that? That’s the interesting bit you’ll find here. Sasikumar’s on-screen sister, Sanusha, is ready with her share of praises for her brother. Before the praises come in, though, the dialogue-less scene where she honks at them incessantly is what I liked the most. This scene speaks about the source of her courage – her brother. It’s also a nice masala bit that stayed with me for some time. However, from that initial vigor, everything goes back to the regular text of Tamil films that are made away from the big city lights of Chennai and Coimbatore. Just a month and a half ago, Tamil cinema saw the release of Meyaadha Maan in which Vaibhav and Indhuja played siblings. In Meyaadha Maan and Kodiveeran, the male protagonists look after their younger siblings – Indhuja and Sanusha respectively – like how a parent would. Their affection for each other comes from the place of dependence and trust. Plus, the lack of parents at their homes draws them closer. The “sister sentiment” in Kodiveeran is taken a step higher as even the villain – played by Pasupathy – has a sister (Poorna). While Sasikumar and Sanusha stand for truth and honesty, Pasupathy and Poorna stand for greed. Vidharth, too, has a sister (Mahima Nambiar) who, by nature, of her mere presence, fits the bill of the romantic interest of the hero. All these men and women flow in and out of the movie quite easily. Yet, the way their characters are designed isn’t something new. Mahima Nambiar gets a fun song in which she dances with Sasikumar because she’s the female lead, and, in the few scenes Sanusha gets that doesn’t involve Sasikumar, she’s seen talking about the greatness of her brother. This kind of heavy-duty hero-worship makes the other characters feel cartoonish. Probably Vidharth is the only actor who doesn’t get to mouth punch dialogues. He appears in ironed clothes, and his short lines do their job perfectly well. But when it comes to the other characters, especially the interactions between Pasupathy’s Villangam and Sasikumar’s Kodiveeran – about the good and the bad of the society, and who’s more powerful – the lines run without punctuations. They just go on and on. I really wonder if this is what happens in small towns (or is it just writer-director Muthaiya’s penchant for such stories and themes that make him come up with such long sentences?). 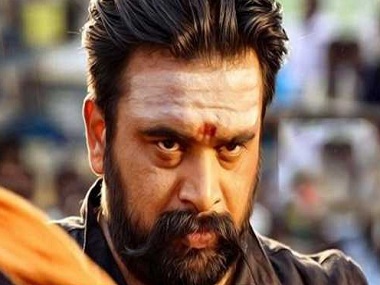 Sasikumar is becoming synonymous with action dramas set in small towns. By now, he must have at least killed 100 men on-screen with his sharp knives and machetes. And the amount of dialogues that praise his skills in these kinds of movies come with a red flag – are they necessary all the time? The punch dialogues went hand-in-hand with the visuals in his last year’s release Kidaari, where he played a thug under the thumb of Vela Ramamoorthy. In Kodiveeran, that flavor of hanging on to the rough end of an action spectacle is missing. The best scenes featuring Pasupathy have no dialogues at all. Look at his eyes when he extends his hand to ask for Poorna’s “thaali” – with a tear drop – when she refuses to part with it after her husband’s demise. That’s what Pasupathy is capable of. Muthaiya’s Kodiveeran hasn’t given me any extra cheer of having watched a gripping drama, nor has it left me asking for water to calm my nerves.